In 2014, in anticipation of our 20th Anniversary trip to Paris, Tom and I took a beginning French language class at Le Petite Ecole Française. Our instructor, Caroline, who was French, was excellent and very patient with us (especially Tom). Caroline also organizes many get-togethers and events for her students and French-speaking people in our area. 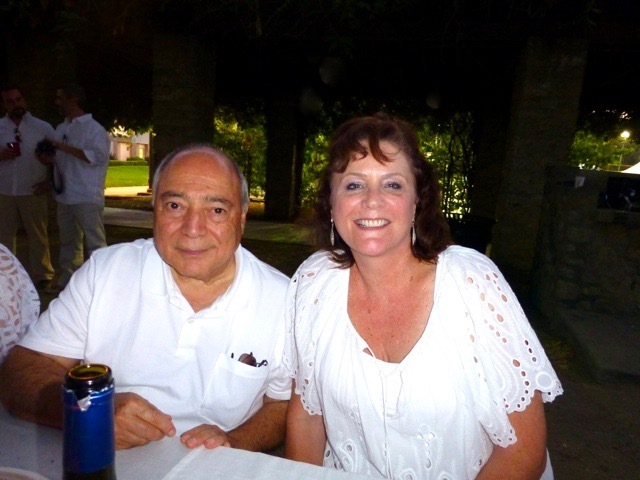 One such event which we attended was an unofficial Dîner en Blanc … a secret Dinner in White where the guests must dress entirely in white for a pop-up picnic dinner. This was so much fun! 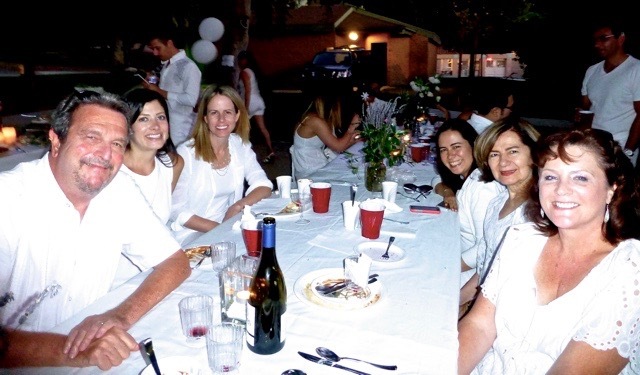 While not an “official” Dîner en Blanc (you have to be invited and there is a huge waiting list for that one), Caroline specified a potluck rather than everyone bringing their own individual dinners and she set up and organized the tables and decorations in advance. Our dinner locale, which we did not learn the location of until the day of, turned out to be the Rose Bowl. 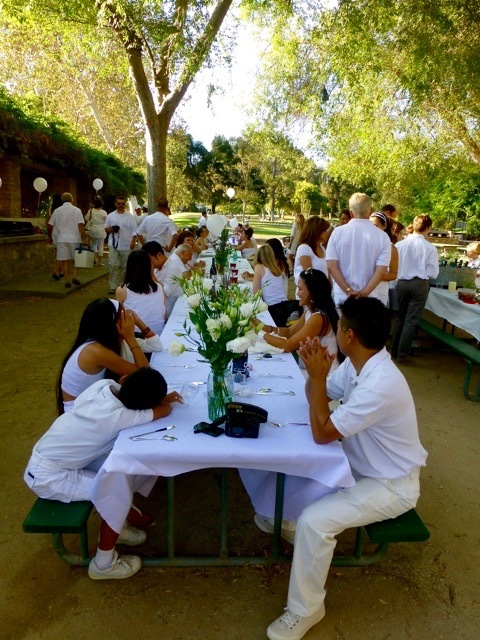 Tom still has the white linen shirt and pants and white canvas shoes he purchased for this picnic. Whether he still fits into his wardrobe is another question. Now the hard part, what to bring for dinner? We signed up for salad and dessert. I knew it was going to be hot as it was in July. 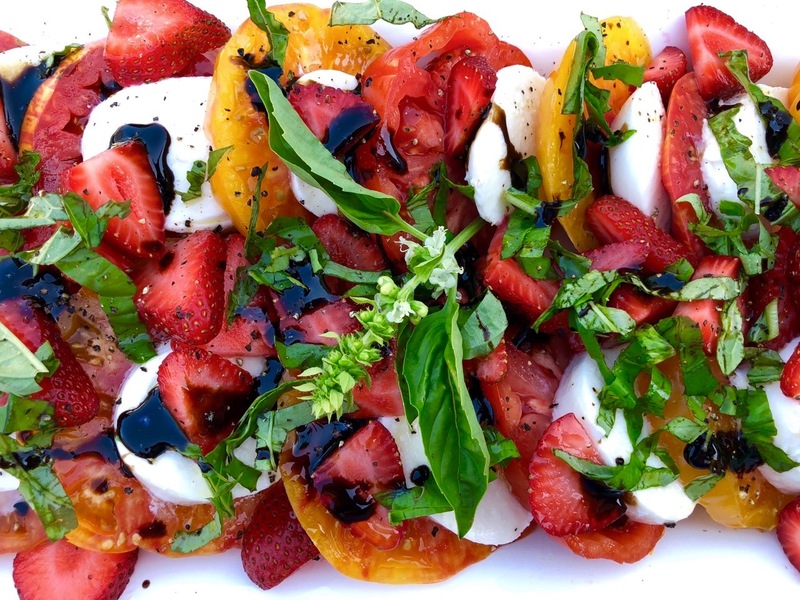 In searching for salad ideas, I came across a recipe for a French Tomato Strawberry Salad. 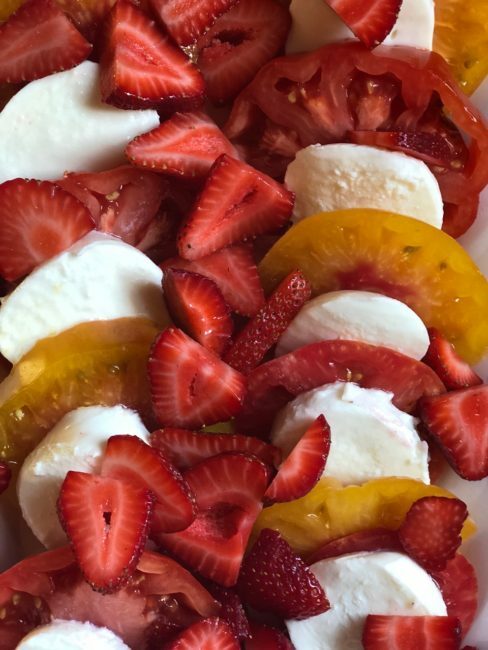 It’s really a Caprese salad with strawberries. 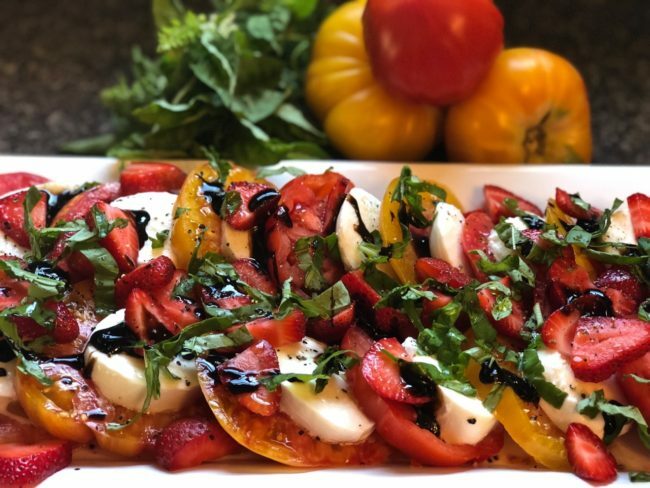 Simple and delicious, sliced heirloom tomatoes and mozzarella, topped with sliced strawberries and basil and drizzled with a quality balsamic and olive oil. 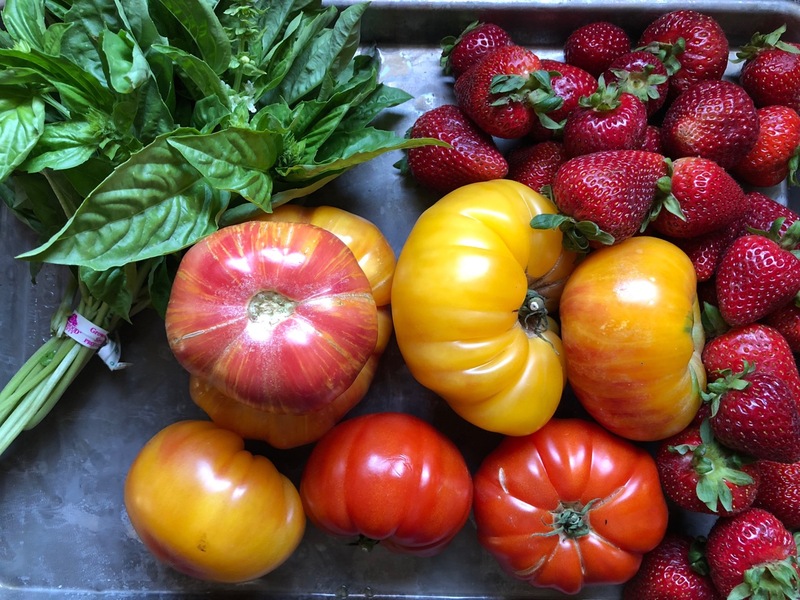 Tom was skeptical at first … strawberries and tomatoes? 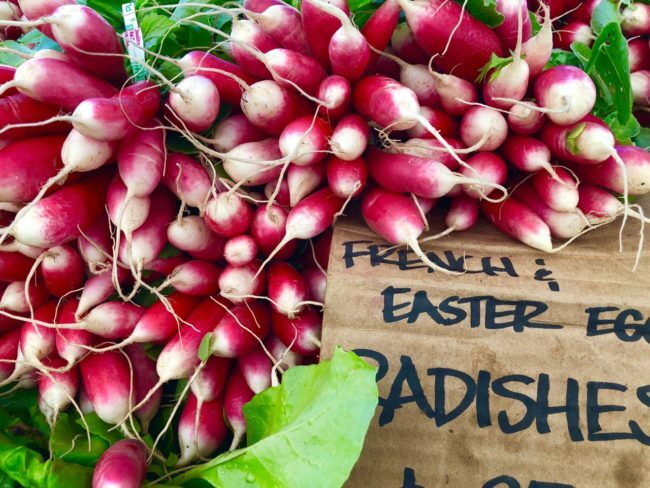 But one taste, and we were instantly transported to Provence (or at least the Rose Bowl). The key to this salad is to use fresh, ripe fruit (yes, tomatoes are a fruit). 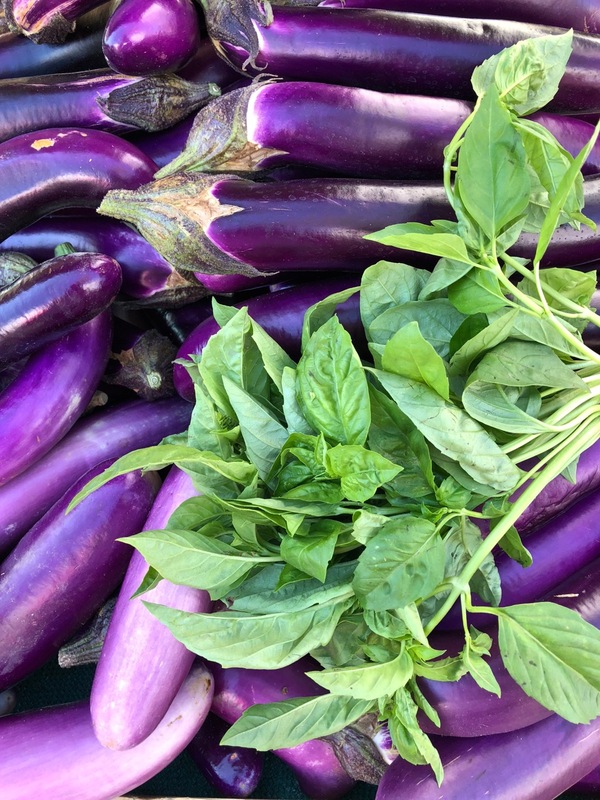 If you can pluck it from your garden, hats off to you! 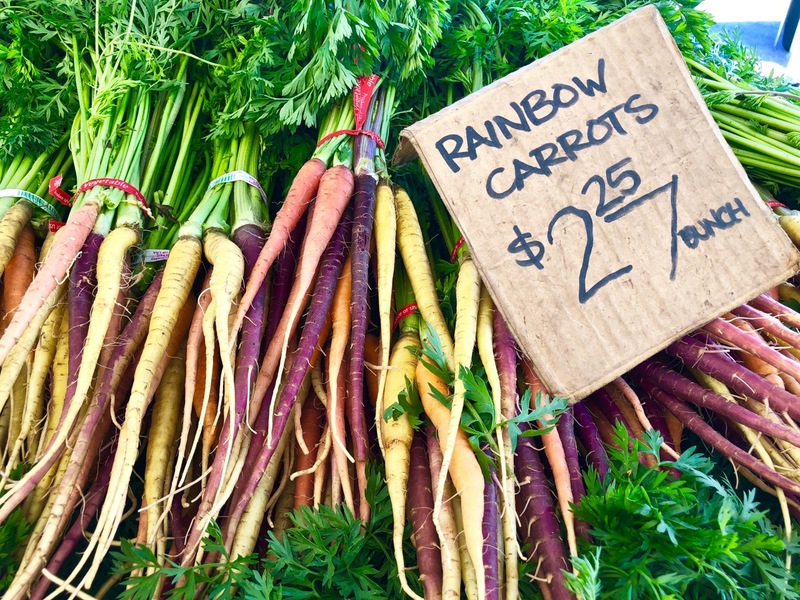 Otherwise, your local Farmers Market is the perfect place to be with its selection of fresh (and colorful) produce items that beg for photos. 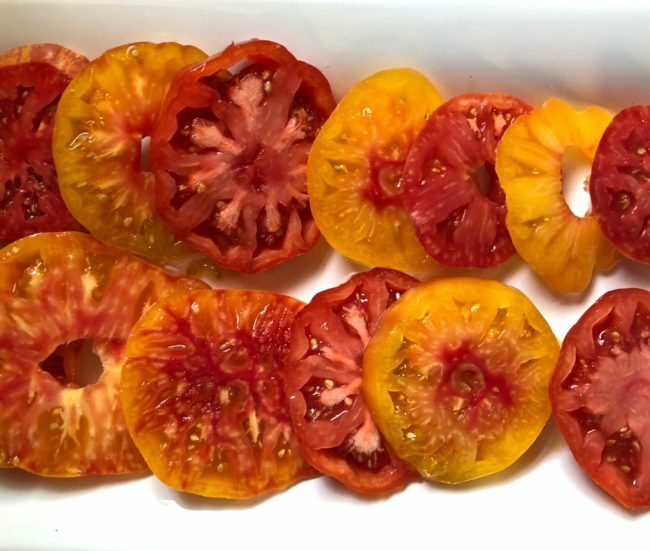 If you can’t find large tomatoes, cherry tomatoes (Sweet 100s, yum) are just as delicious. 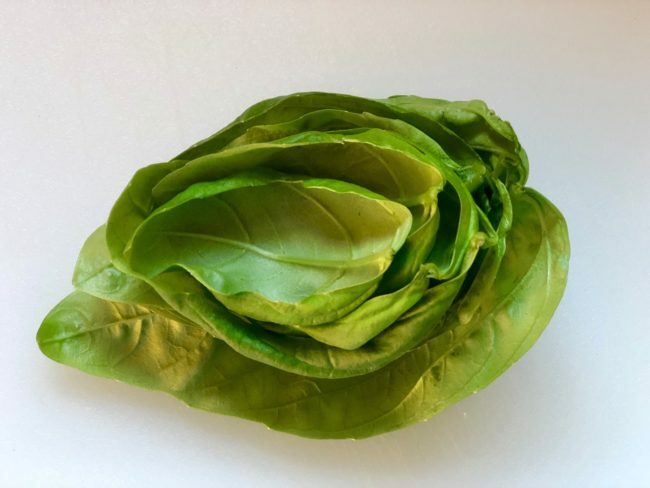 This salad is best eaten on the day you make it. As far as the cheese, a fresh mozzarella or a buffalo mozzarella is the bomb with these ingredients. 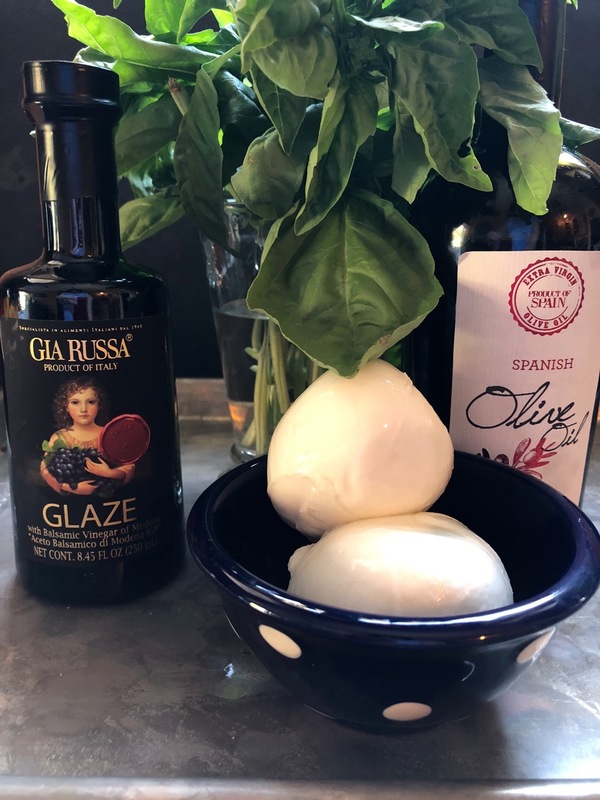 Burrata would be an excellent choice, too. Serve with a crunchy baguette and a bottle of French wine, possibly a rosé or champagne, and ooh, la la … summer in Paris! 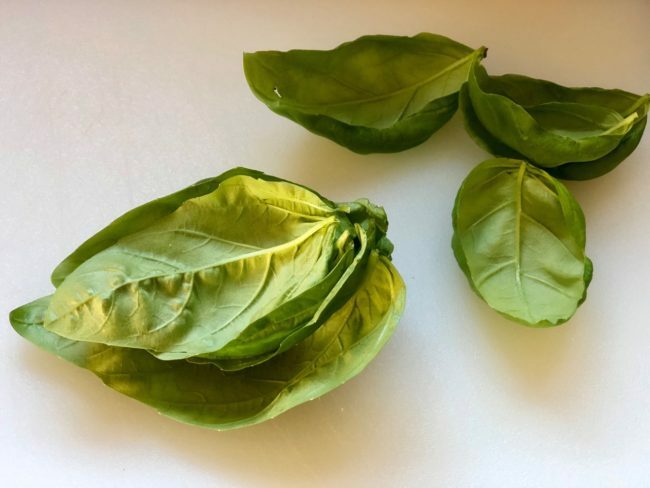 To chiffonade the basil, wash and dry the leaves and stack them on top of each other beginning with the largest leaves on the bottom. Roll them tightly together and then thinly slice the roll to produce ribbons of basil. Of course, you can just chop the basil, but I think ribbons are more festive. The amount of ingredients will depend on how many you are serving. (I used 3 large tomatoes and 1 basket of strawberries for the 9 x 18 inch platter shown here.) Layer the ingredients in the order listed above on a platter. 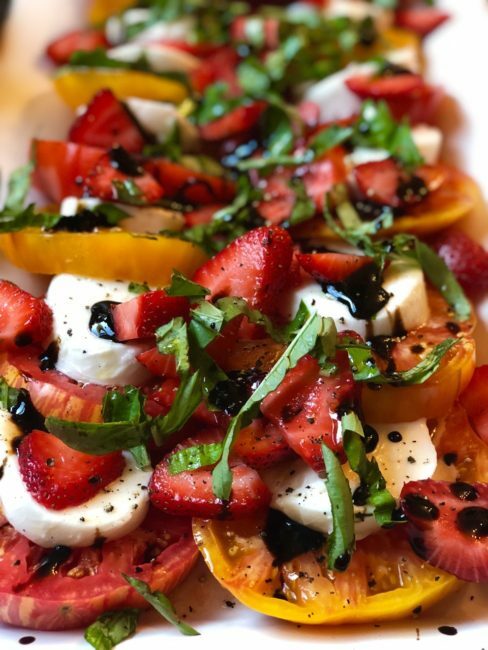 Drizzle with the balsamic glaze and olive oil, finishing with a couple of grinds of black pepper to taste. * If you don’t have any balsamic glaze handy, you can easily make your own by stirring together 1 c. balsamic vinegar with 6 T. dark brown sugar in a small saucepan. Bring to a simmer, stirring constantly and cook just until the mixture is reduced by about half and slightly syrupy, about 2 minutes. 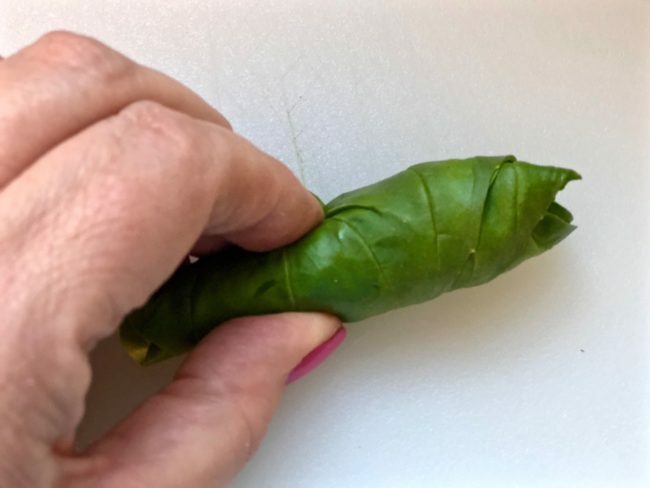 Be careful not overcook as it will turn bitter. The glaze will thicken more as it cools. For more on Dîner en Blanc click here.